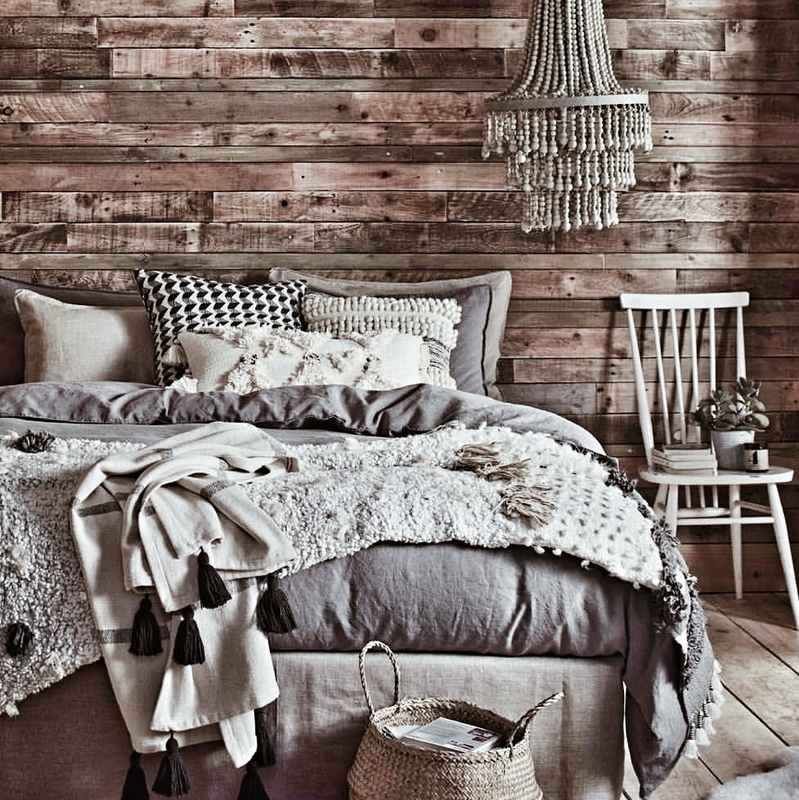 This wallpaper was on the front cover of Living Etc and I loved it at the time although it is not my usual Scandi Rustic style! After a couple of years we saved up enough to get rid of the #lunaticasylumdentistdoors and replaced them with a big picture window instead which gives us an amazing view out over the garden and makes the loft extension blend (or speak as Kevin McCloud might say) much better with the contemporary style of our kitchen extension. The newly installed big picture window. We also have a smaller window to the side which opens. I also went for a darker paint shade on the walls (Dark Lead from Little Greene) and added a gallery wall to create more of a focal point. The room started to feel a little bit less portakabin but I wanted to make more a feature of the wall behind the bed so I wallpapered it with some faux wood effect wallpaper from Andrew Martin. Whilst it definitely made the room more interesting and looked pretty convincing in photographs I couldn't ignore the nagging feeling that my dad (who I usually don't defer to on decorating decisions on account of his love of #clutteredgothicchic) might be right when he said it looked a bit naff up close. 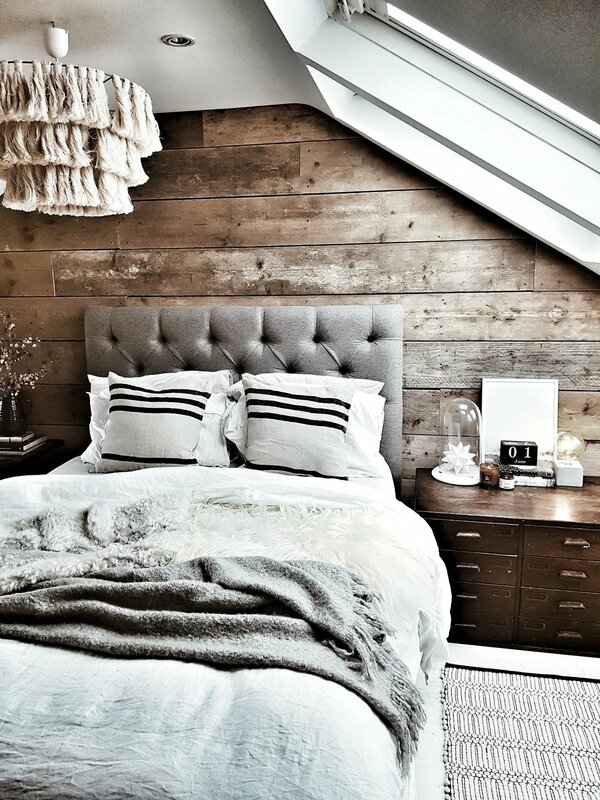 I also couldn't get this picture from my pinterest out of my head which featured a bed against a wall of reclaimed wood. I loved the texture and warmth it created. However I was pretty sure that my DIY skills didn't extend to cladding an entire wall in wood on the basis that they are yet to encompass changing a light bulb so I got my next door neighbour who is a carpenter to give me a hand. 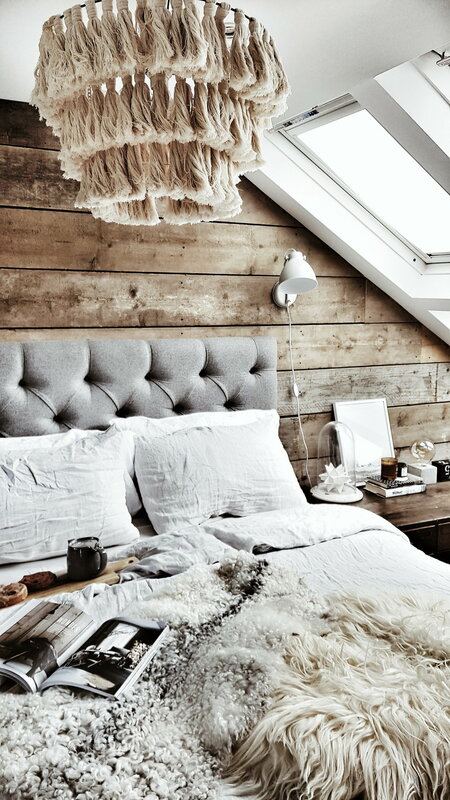 Note to self if you ask your neighbour to nail a ton of old scaffold planks to your bedroom wall he will regard you in much the same as way as if you are asking him to nail Sanitary Pads to the wall. However it was worth enduring #AlwaysUltraWallFace because I absolutely loved the finished result. 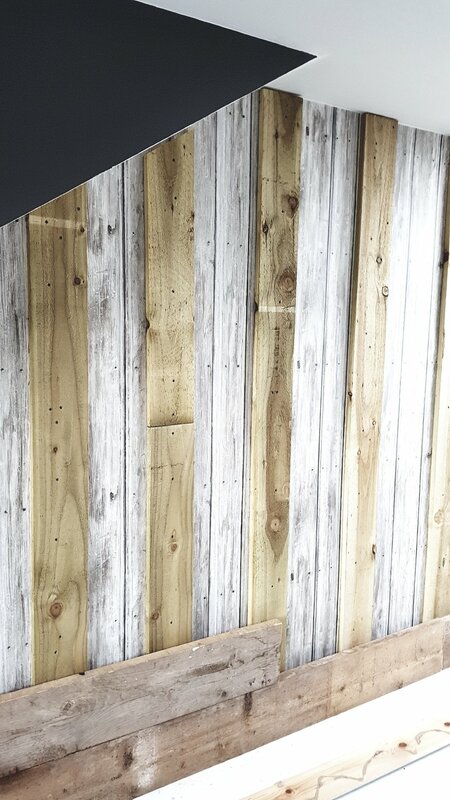 If you are London based and looking to recreate the look then Forest Recycling Project based in Walthamstow is a great place to source your reclaimed wood. 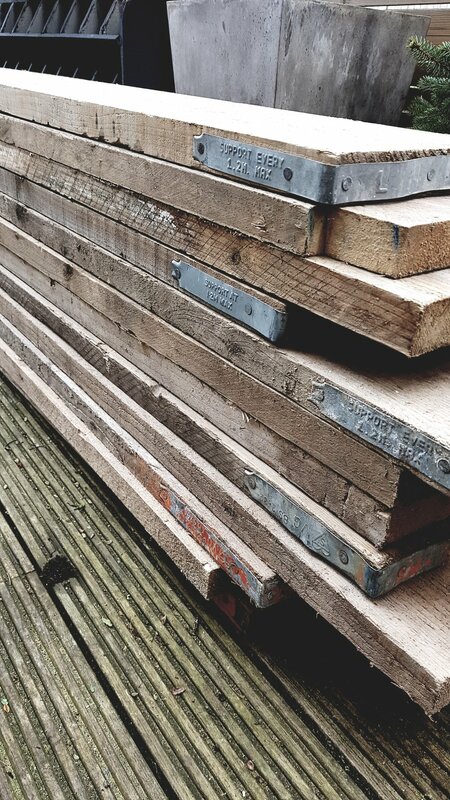 They have a huge stock of scaffold boards all for a reasonable price compared to some I have seen being sold on ebay for the same price as a small convertible car. The final big change I have made is to upgrade our mattress and bed which, after 10 years and the arrival of three kids had seen a lot of action (although latterly probably less of the kind Mr Malmo would prefer!). The fabric on our old bed had started to fray and the mattress was getting saggier than my spaniel's ears. I had always wanted a button back head board but they can stray into foootballers wives territory (and alas I am not Victoria Beckham). I wanted to find one which was less Rooney and more rustic. 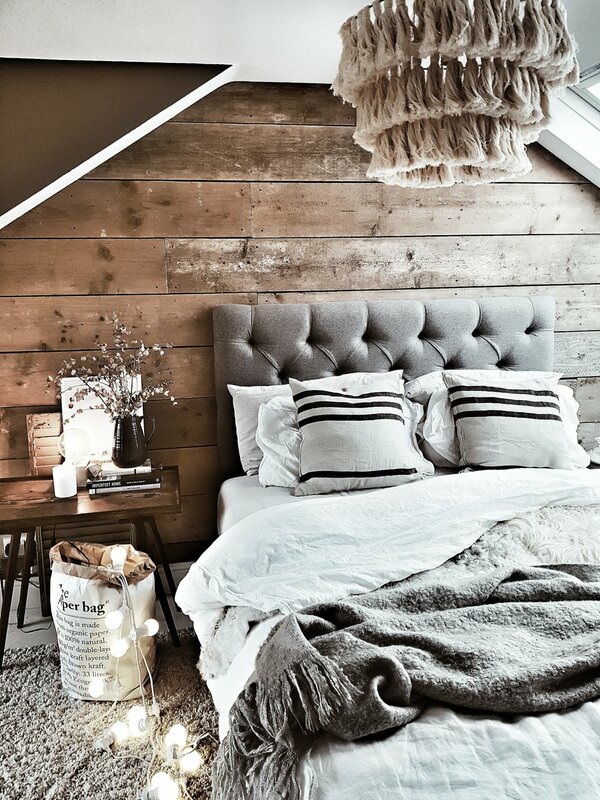 I therefore jumped for joy when I spotted this picture of a Button & Sprung bed in a magazine featuring not only the bed of my dreams and with a wooden wall behind it to boot! Button & Sprung are a predominantly online bed & mattress retailer (although they have a showroom in London) and all of their beds come a right to a free return within 100 days. However there is no chance I will be sending my bed back. The fabric and frame are both brilliant quality and it fits perfectly with my rustic/scandi style. It is the Foxtail in Nickel soft wool but there are a range of other great fabrics to choose from including some lovely linens and velvets in both neutral and brighter colours. When it came to the mattress I was lucky enough to be approached by Emma Mattress and asked to try out one of their memory foam matresses. I was, I confess, initially quite skeptical when it arrived in a box that looked liked it contained a hole punch rather than a kingsize mattress but after a couple hours out of the box it was ready to roll. If you like your mattresses firm without it feeling like you are sleeping on a concrete slab then this is the baby for you. It genuinely delivers an insanely good night's sleep and having err fully road tested it so to speak, I can confirm it also copes well with activity of a slightly more vigorous nature than sleeping. If you would like to see for yourself (the mattress rather than us road testing it) then you can get £100 off any original or second generation Emma Mattress with the code Malmo100. One mattress out of the box and ready to be road tested once I have moved those instagram styling props! With the new bed and mattress in place our duvet and pillows, which had seen Mr Malmo through his student days at Manchester and somehow joined us in marital life, were seriously letting the side down. The duvet was about the same consistency as cold rice pudding and the pillows could easily have been used as sandbags should the Environment Agency require extra flood reinforcement this Winter. Their replacements are from the Secret Linen Store and it now feels like we are sleeping in Angel Delight (in the sense that the duvet and pillows feel gorgeous, light and fluffy rather us emerging covered in pink mousse of a morning). We went for a goose down all season duvet which means it has an extra layer of fluffiness you can clip on when our weather front once more steps back in line with Siberia rather than Spain. Secret Linen Store were also kind enough to gift me some of their bedding to try out. I went for the pebble linen bedding and dove grey striped undersheet. The linen is just the right kind of no need to iron but still looks amazing slubby and I can really tell the difference in quality compared to budget linen sets I have bought in the past. I am also a sucker for beautiful packaging so I loved how all of the bedding arrived parcelled up. 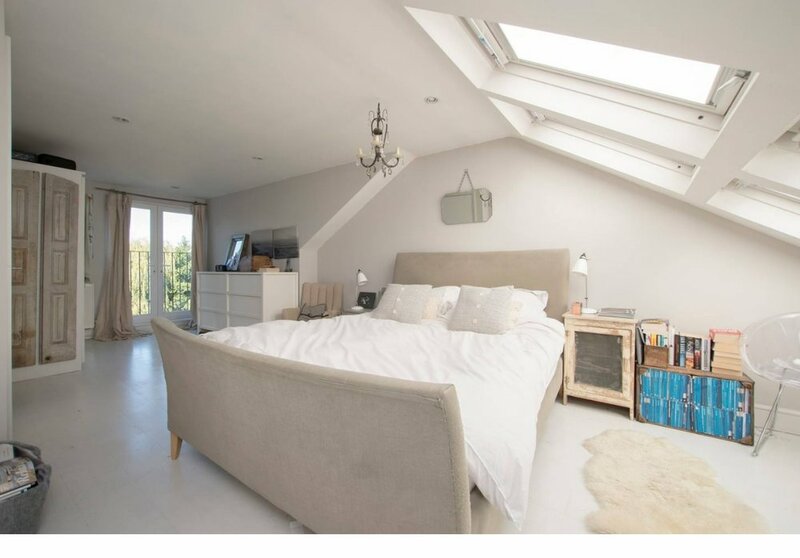 There are still a few tweaks I am thinking of making to finish the renovation of this room off, including most importantly acquiring either curtains or a blind for that big picture window as am fairly sure my neighbour doesn't want to see #MalmosMuff when he is taking his bins out. But for now I am pretty happy with how it has all come together. 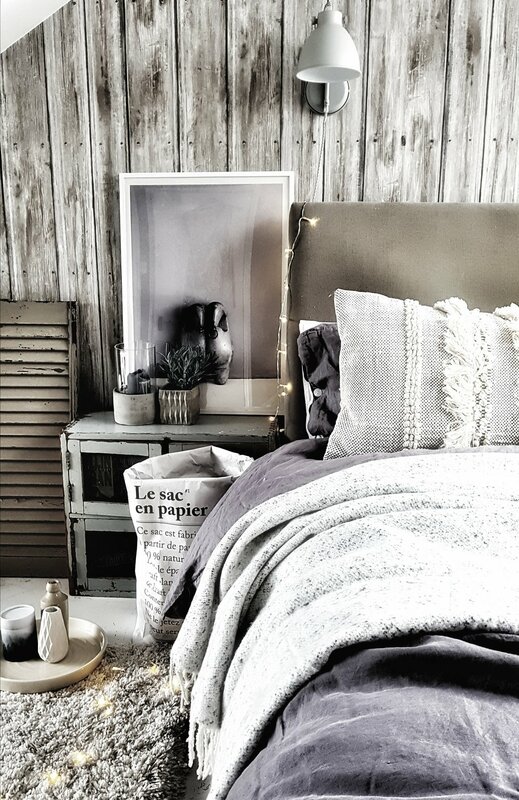 Many thanks to Button & Sprung, Emma Mattress and Secret Linen Store for partnering with me on this project and helping me to transform it from #SuburbanPortaKabinPants to the relaxed rustic bedroom of my dreams.